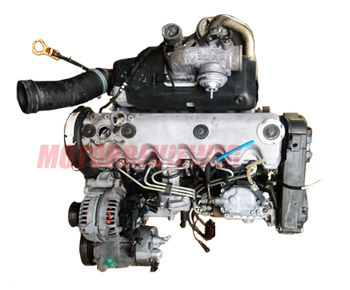 This engine is the 2.5-liter 5-cylinder inline turbo diesel engine with pump injection system. Its life began in 1989. The engine was designed and developed by Audi, and it was the first Turbocharged Direct Injection engine in the production. The primary development goal was to use the engine in various models. The cylinder block is made of gray cast iron. It has six main bearings and forged steel crankshaft. Aluminum pistons have bowl-shaped geometry. On top of a block, there is the aluminum 10-valve cylinder head (two valves per cylinder). There is only one camshaft (SOHC), which is driven by timing belt. The valvetrain is equipped with hydraulic tappets/lifters for automatic valve clearance compensation. The fuel delivery system consists of the belt-driven Bosch VP37 electronic distributor injection pump and two-stage direct injection (DI) with five-hole injector nozzles. The engine is turbocharged. There is Garrett variable geometry turbocharger (VTG), cast aluminum intake manifold, and no intercooler. The engine was very successful. It was quite simple yet, didn't have sophisticated systems and electronics. It was easy to maintain and tune. The longevity is tremendous with proper operation. The fuel consumption is pretty low for this size of displacement. R5 diesel engines also were being installed into Volvo cars. The new generation of 2.5 R5 diesel engines started in 2004 from the production of 2.5 R5 TDI PD and 2.5 R5 TDI CR. 88 hp (65 kW); 144 lb ft (195 Nm)/1,900 rpm - that is Volkswagen Transporter T4 engine. 102 hp (75 kW); 184 lb ft (250 Nm)/1,900 rpm - more powerful engine version for Volkswagen Transporter T4. 109 hp (80 kW); 195 lb ft (265 Nm)/1,900 rpm - Volkswagen LT engine. 116 hp (85 kW); 195 lb ft (265 Nm)/1,900 rpm - application: Audi C3 100, Audi C4 100. 140 hp (103 kW); 214 lb ft (290 Nm)/1,900 rpm – widely used engine. Application: Audi C4 100, Audi C4 A6, also known as Volvo D5252T engine: Volvo 850, Volvo S70, Volvo V70, early Volvo S80s. AHY, AXG - 151 hp (111 kW); 218 lb ft (295 Nm)/1,900 rpm. That is the top Volkswagen Transporter (T4) engine.